A beautifully decorated lobby with fireplace greets our guests at Americas Best Value Inn Osceola which offers wallet-friendly rooms and a convenient location. The two-floor Americas Best Value Inn Osceola offers free Wi-Fi cable TVs with HBO work desks pillow-top mattresses and dark-wood furnishings in all 35 of its traditionally styled rooms. Non-smoking rooms can be requested. The inn provides an expanded continental breakfast every morning and there's a full-service restaurant next door. The guest-use computer in the lobby along with printer and fax comes in handy. Parking is free. 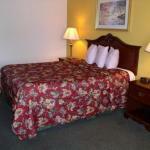 Located just off I-35 Americas Best Value Inn Osceola is five minutes from Southern Hills Winery. Terrible's Lakeside Casino is just over two miles. East Lake County Park a favorite place to walk the dog feed the swans or take a stroll is three miles. Des Moines International Airport is 44 miles.